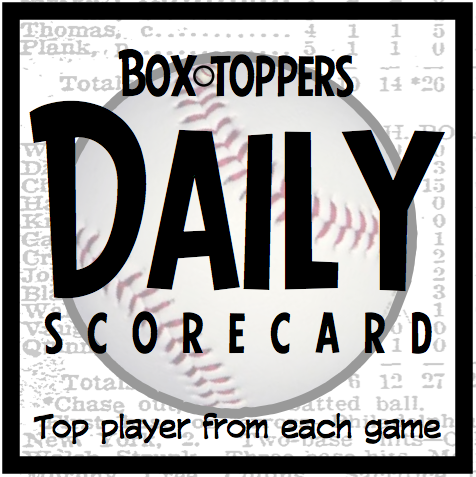 Manny Machado of the Orioles is Friday’s Box-Toppers Player of the Day. Machado hit three home runs, including a walk-off, ninth-inning grand slam, in the 9-7 win over the Angels. Machado, who also hit a three-run homer, went 3-for-5, scoring three times and driving in seven runs. National League Player of the Day—Brandon Crawford of the Giants homered, doubled and went 2-for-3, scoring twice and driving in two runs, in the 10-2 win over the Phillies. Batters of the Day—There are no separate American League or National League Batters of the Day for Friday because the overall Player of the Day is AL batter Manny Machado and the overall NL Player of the Day is batter Brandon Crawford. Notable—Jay Bruce of the Indians has the most 2017 Box-Toppers points of any of the 15 who earned Player of the Game honors Friday. Bruce (2HR 3-5 3R 5BI in the 10-1 win over the Royals) earns 1.0 Box-Toppers point, giving him 9.0 for the season. He ranks 23rd among all players and third among AL batters, behind Edwin Encarnacion of the Blue Jays (11.1) and Aaron Judge of the Yankees (9.2). Second-ranked Max Scherzer of the Nationals (22.0 Box-Toppers points) was scratched from his scheduled start against the Padres and was placed on the disabled list with a sore neck. Scherzer had the chance to take the season lead in Box-Toppers points, passing Dodgers pitcher Clayton Kershaw (22.1), if he had earned Player of the Game honors Friday. Scherzer’s replacement as starter, Matt Grace, earned Player of the Game honors, making his Box-Toppers debut (see below). Fifth-ranked Ervin Santana of the Twins (14.4 Box-Toppers points) did not earn Player of the Game honors in the 10-3 win over the Diamondbacks. Santana (6.0IP 7H 3R 3BB 6K W) had a Box-Toppers game score of -4.0. Player of the Game was Miguel Sano of the Twins (3-4 2R 3BI) with a Box-Toppers game score of +4.0. Seventh-ranked Corey Kluber of the Indians (14.0 Box-Toppers points) did not earn Player of the Game honors in the 10-1 win over the Royals. Kluber (5.1IP 6H R BB 4K W) had a Box-Toppers game score of +0.1. Player of the Game was Jay Bruce (2HR 3-5 3R 5BI) with a Box-Toppers game score of +6.0. Kluber exited the game with a minor ankle sprain. Nicky Delmonico of the White Sox (2HR 2-3 2R 3BI in the 4-3 win over the Rangers) made his Major League debut Aug. 1 and was playing in his 15th career game. He is the 3,887th player to debut in Box-Toppers since record keeping began in 1995. Nationals pitcher Matt Grace (4.1IP 2H 0R BB K ND in the 7-1 win over the Padres) made his Major League debut April 22, 2015, and was playing in his 61st career game. He is the 3,888th player to debut in Box-Toppers since record keeping began in 1995. Scoring—Machado earns 2.0 Box-Toppers points for being Player of the Day and Crawford earns 1.7 points for being NL Player of the Day. All of Friday’s other Players of the Game (listed in the chart below) earn 1.0 Box-Toppers point.